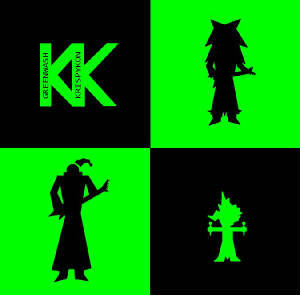 Before The Icily Polite changed their name, they were known as KrispyKon and released one album, Greenwash. Greenwash is notable for its distinctive electronic-alternative-rock style and layers of vocals, with a lyrical emphasis on environmentalism, society and religion. It was written with eight members, before The Holy Tomater joined, and spurned four singles, which were released online as free downloads and are still available as The Kollection. Those singles were Cloud 9, Anarchy, Studded Skies and Disciple.